Squash House Quilts: What the ?!?!?!? ...Sasha strikes again! 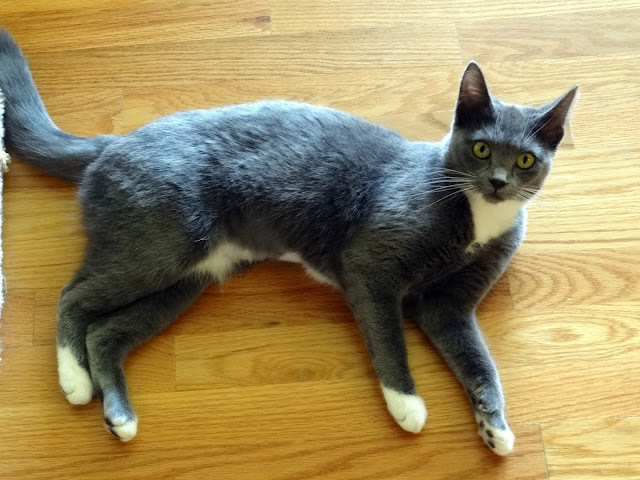 If you've wondered where I've been since my last post let me just say a new and very young cat takes up a lot of time and energy! Here she is right after being named the guilty party. Who me? Nahhhhh - couldn't possibly be - I'm just too cute! A little while later I heard something in the dining room and walked in to see this! Let's follow the paper trail, shall we? 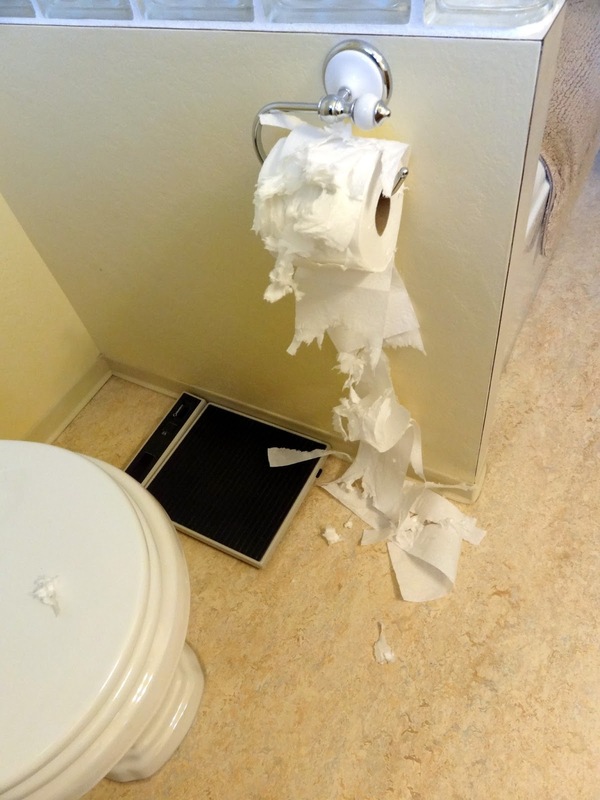 Uh, oh - looks like this bathroom needs to have a paper guard, too! We have three bathrooms in the house and have already learned to keep two of the doors closed. Unfortunately, this is Sasha's bathroom. 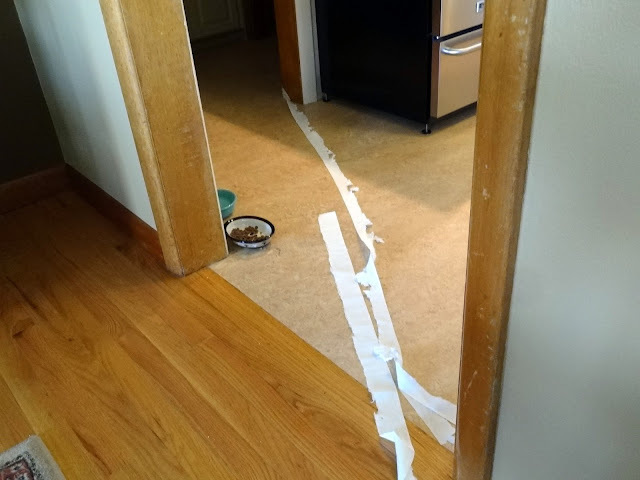 Until she can learn to open and close the door herself (and I DO think she's capable) the TP will have to stay under the counter! Now that her "cone of shame" is off, she is quite the busy little girl. We've had to lay in a large supply of "mice" as they disappear just about as fast as we get them! Mr. Squash was down on the floor today with a long handled duster attempting to retrieve two that had found their way under the stove. 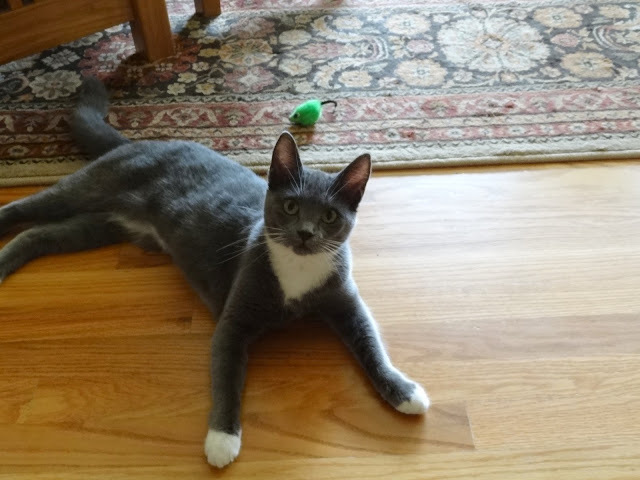 She'll play with her mice for hours on end - throwing and chasing them up and down the halls. We call it Kitty TV! Who knew such a tiny bundle could bring us so much love and joy! On the sewing front I've been doing some Supreme Pattern testing. I won't be able to show you the results for a while yet, but let's just say they're awesome! 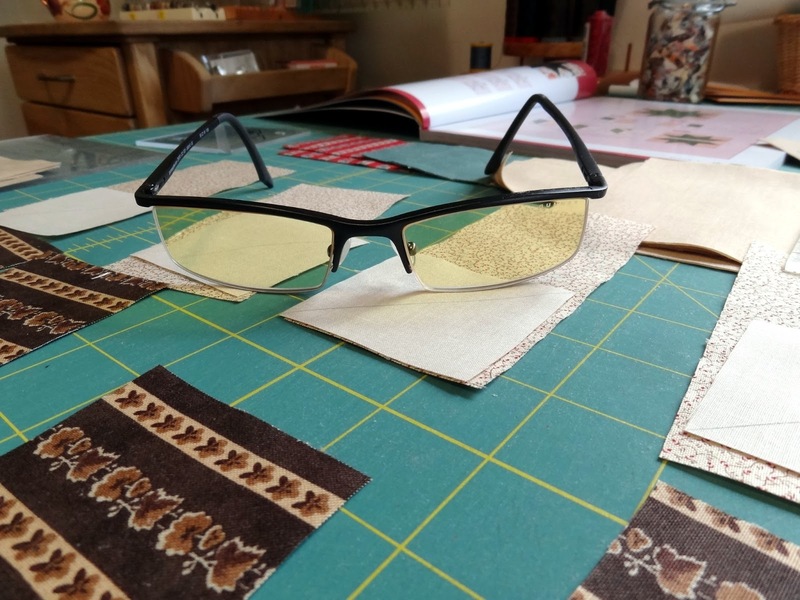 I'm having much success sewing with my new Gunnar computer/reading glasses! They have amber colored lenses which are supposed to reduce eye fatigue when you're on the computer. I'm hear to tell you they work great! They're also larger and wider and slightly curved so more of the area you look through is covered. The project you see on the cutting board is a quilt I started last year using the No-Y Seams method. I had put it away while doing some Supreme Pattern testing and got a tad sidetracked - like several months sidetracked! Normally I finish what I start. Hopefully I can get the rest of the blocks done now - that is in between Kitty TV and spring gardening! Oh my gosh - I'm just sitting here laughing at Sasha! And she has such an innocent look on her face - are you sure she is the culprit? I think Mr Squash is doing it and trying to frame that poor, innocent kitty! Sasha the Shredder - she looks so innocent! And she sounds like the perfect addition to your family. FYI, I see auto correct strikes again!! I meant "so" and "some" in my comment. Lol. Oh, but it looks like so much fun!!! I think we are all in agreement about the expression on Sasha's face. We have had a couple of furkids that knew that same trick...too funny..love your new glasses. One of our cats had the same fetish. Too funny! I've heard if you put the roll on the other way it is harder for them to unroll it. Mine grew out of this game (or got bored) before I got to give it a try. Can't wait to see your secret sewing! Oh, been there and done that!!! 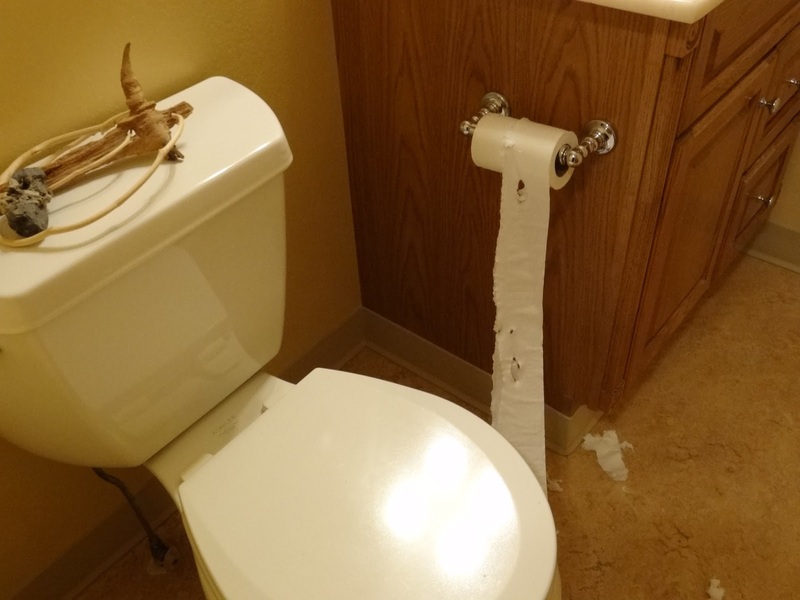 I guess you could get a toilet paper guard. I think I saw one either on a blog or in a magazine the other day. Let's just hope that she will grow out of it soon. Meanwhile, give that girl a hug for me, okay? LOL that's cute. Frustrating, but cute. I have been lucky, my cats have never done that. I guess they're too busy getting into trouble elsewhere. I love Her Royal Cuteness! Paper trail, you crack me up. They always look so innocent when it's sticking right out of their mouth. :o) You rock, Supreme. Good to know about the glasses. Your first photo got my attention. The rest was icing on the cake. How funny little Sasha is! Just like a toddler!! WHat a fun post! Sam and I are sitting here laughing our heads off at Sasha's antics. WHat an absolute sweetheart. With that look of innocence, there is no way you can be mad at her. That is a VERY cute cat. What a super cool cat!!! I once bought a lifetime supply (so my mind thought) of toilet paper at a very inexpensive price. I came home from work to find "snow" covering the entire house. It's all circumstantial evidence! I think Sasha needs a court appointed attorney. Keep those pictures and stories coming! Very funny! Yep, at our house the bathroom doors used to have to stay closed. But later it was only the toilet seat lid that needed to stay down. Sasha will keep you very entertained, I'm sure. Enjoy your piecing and new specs! 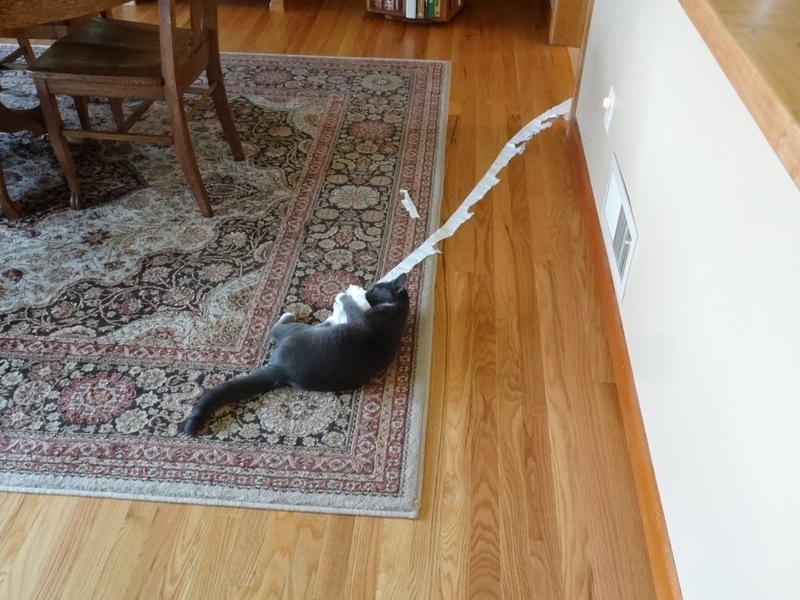 I love the photo of Sasha playing with the TP "ball" while a trail of it goes out the door! I have a cat (now grown) whom I called "the devil spawn" when he was a kitten because he was such a rascal. I'll look forward to more cute kitty posts. Candace, I'm sitting here in need of a smile and your post gave it to me, thank you. LOL at Sasha! Butter wouldn't melt in her mouth! Good luck sewing. I have a project at the cutting stage. It is just a matter fo having the time at the moment. How can you say No to such a innocent face like Sasha. Maybe the TP jumped in front of her, what's a cat to do but play. Caity Did Winner and a New Project! A New Supreme Finish and Giveaway!